Amazon on Thursday announced a bevy of new media products including the rumored $50 tablet and a new Fire TV set-top box capable of playing 4K content. The budget-minded tablet – known simply as the Fire – ships with a 7-inch IPS display operating at a resolution of 1,024 x 600 that’s powered by a quad-core MediaTek processor ticking along at 1.3GHz with 1GB of RAM on tap. It also includes 8GB of internal storage (expandable via microSD card slot) as well as front and rear cameras. Obviously the specs aren’t anything impressive but again, this is a $50 (technically, $49.99) tablet that’ll compete with the no-name entry-level slates of the world. At that price point, most would feel comfortable letting a child handle it (instead of your $650 smartphone). Amazon’s new Fire TV set-top box, meanwhile, is said to offer 75 percent more processing power than its predecessor, five times the processing power of the latest Roku and eight times the processing power of Chromecast thanks to its quad-core MediaTek processor. It also includes 8GB of local storage expandable via microSD card and 802.11ac MIMO Wi-Fi. The ability to play 4K Ultra HD content and Alexa integration, however, are the most notable additions to the new Fire TV. 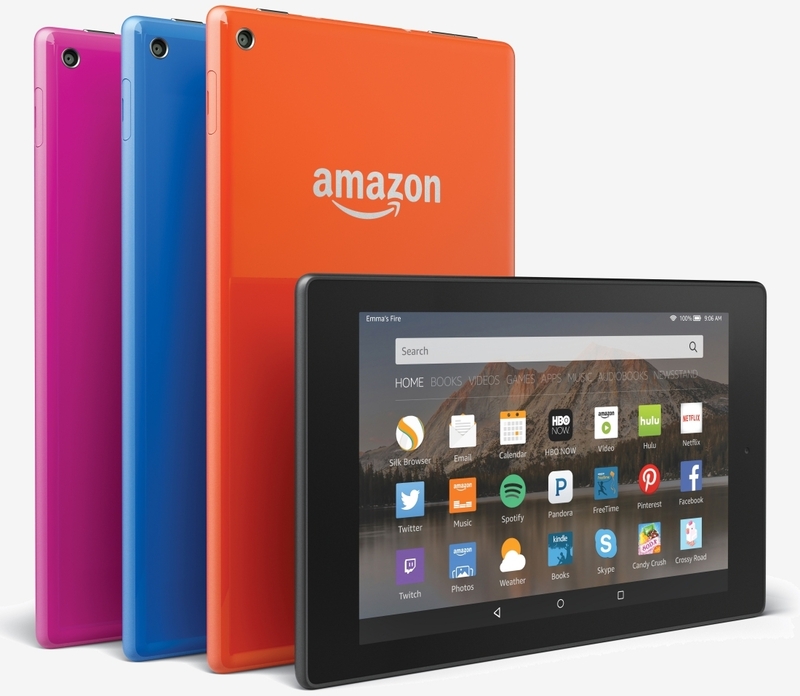 The 7-inch Fire tablet starts shipping September 30 for $49.99. Curiously enough, Amazon is also offering a six pack for $249.95 (buy five, get one free). The new Fire TV is priced at $99.99 and will begin shipping on October 5. Amazon also announced a Fire TV Gaming Edition that includes updated hardware, a refreshed game controller, a 32GB microSD card and two games for $139.99, a Fire Kids Edition tablet with a “kid-proof” case and a two-year, worry-free warranty for $99.99 and new Fire HD tablets with screen sizes of eight inches and 10.1 inches for $149.99 and $229.99, respectively.